This repository consists of a collection of resources aimed at the development hybrid publications, in both reflowable format (EPUB3) and fixed layout (Scribus and inDesign structured content). The resources propose a workflow based on the conversion between markup languages, using Pandoc and Markdown source-files as its essential elements. Most of the ideas materialized in this collections of resources originated from the Digital Publishing Toolkit research project, specially the cotnributions of Michael Murtaugh and Silvio Lorusso. Note: The section "6.3. Do-it-yourself EPUB using Pandoc" form http://networkcultures.org/blog/publication/from-print-to-ebooks-a-hybrid-publishing-toolkit-for-the-arts/ is an important complement to this set of tools. This repository is a small effort towards systematizing, automating and document a workflow for creating hybrid publications. Don't hesitate to use, change, or comment upon these tools. Drop me a line, I'd love to hear your feedback. Markdown - Source - convert the manuscript files to Markdown files. make folders creates the folder structure necessary to make use of the Hybrid Publishing Resources. This is a preparatory stage. Yet it is highly important for the series of conversions that will lead to the different outputs. You can be editing the .docx document - the manuscript - using styles, as to add a structures (headings, footnotes, blockquotes, etc), that will be preserved through the different conversion stages and into its outputs. make markdown converts all the .docx files inside the docx/folder into Markdown files inside md/. 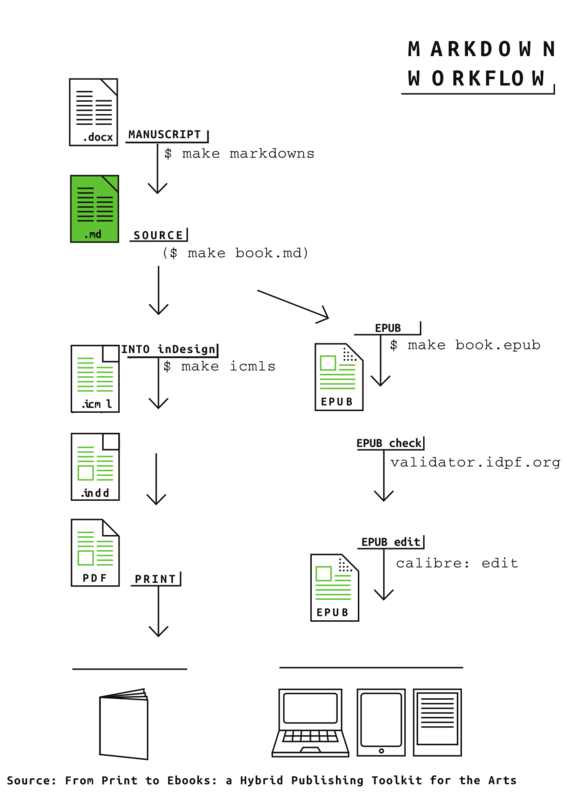 The resulting Markdown files will become the source files, from which all of the publication's outputs will be generated. Markdown was chosen as a source format based on easiness by which Markdown is both written and read, the high compatibility with other markup languages (HTML, ICML, LaTex), and its explicit structure. If the publication contains images, at this stage, you should insert the images into the Markdown files. Each Markdown file contains a metadata header. You either fill the fields with the corresponding information or ignore them. make icml converts the Markdown source files into ICML files (in icml/), that can be imported (placed) into inDesign. ICML files are useful, since they ensure that the structural information from the Markdown source files remains present in an inDesign, and content and structure to remain updatable, even when the ICML is placed in a inDesign project. This connection between source and output (Markdown and inDesign project) is only possible if in the inDesign project, the link to the source ICML is maintained, meaning that the content has to be layout using paragraph and chapter styles, instead of intervening into the text. Note: malformed hyperlinks will cause problems (crashes) when imported into inDesign. Keep an eye for malformed hyperlinks in the Markdown sources. make scribus converts the Markdown source files, into HTML files (in scribus_html/) that can be imported by Scribus, since Scribus can import HTML wrapped only by a <body> tag. To import an HTML files into Scribus you need to use the Insert -> Insert Text Frame tool. Use it to select the space the text will occupy. Inside that space do a mouse right-click, select the option Get Text and import the HTML file. A list of HTML tags supported by Scribus can be found in http://wiki.scribus.net/canvas/Help:Manual_Importhtml. make book.md is a step essential to the creation of the EPUB, as it gathers onto book.md, content from all the Markdown source files inside the md/ folder, in alphabetical order (00 to ZZ). However, you don't have to perform this step, as the Makefile does it for you every time you generate an EPUB. make book.epub creates the EPUB book.epub. To produce an EPUB a few files come into play, namely: the cover image, metadata, stylesheet, and fonts. These files will strongly influence the EPUB's outcome, consequently they must be edited for each publication. It is unlikely that the first time you go through this process of conversions, you'll achieve a satisfactory EPUB. You might have to go through of a iterative process of editing (content, structure, styles, and metadata), make book.epub, view the result, a few time times, until you are happy with the result.